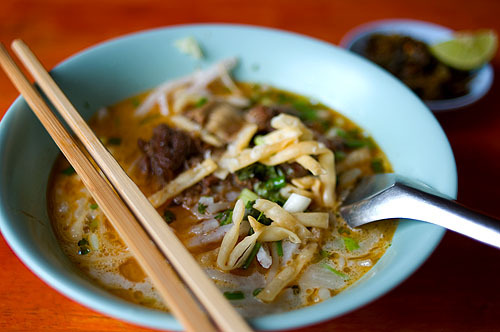 This may look like just another bowl of beef khao soi, but they do things a bit differently at Khao Soi Islam, in Mae Sai. Rather than the typical yellow wheat and egg noodles, this version, which they call pa pa soi, employed thick noodles made from brown rice. The noodles were short and coarse, and had the texture and appearance of boiled taro, which is initially what I thought they were. Another interesting thing about this restaurant was that the owners, Thai Muslims of Chinese extraction, and staff communicated in a seemingly flawless mixture of Chinese, central Thai, northern Thai and Burmese.